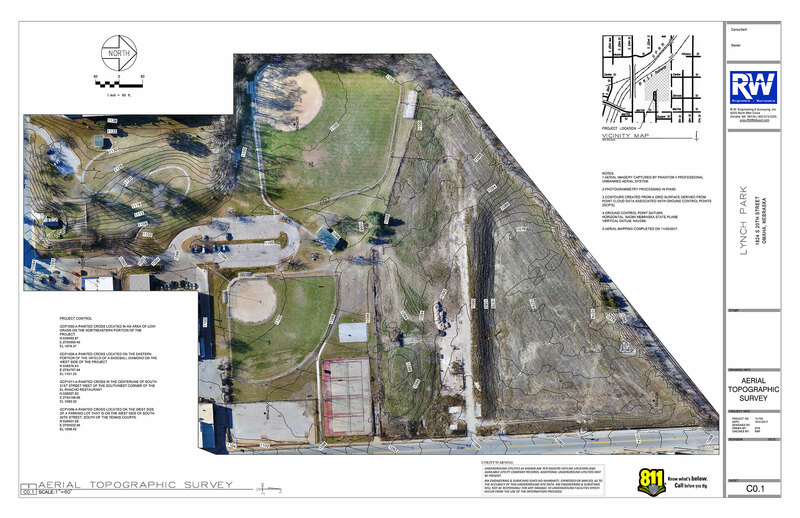 RW provided aerial mapping services to the City of Omaha’s Parks department during the early planning phase of a park renovation project. RW mobilized our mapping crew to the site and deployed a Phantom 4 professional UAS (Unmanned Aerial System). Ground support crew members distributed a dozen survey grade ground control points throughout the site before the craft was launched. RW mapped the site over three concurrent missions collecting nearly 500 individual images. Post-flight processing of the data resulted in the individual photos being tied together and geo-referenced to the surveyed ground control points to create a beautiful orthomosaic photo. The entire site is accurately located in the correct geospatial location. The benefits of Aerial mapping vs traditional surveying on this project were a vast reduction in field time and a much quicker turnaround for the client.